Bandung is known by many as a city of culinary adventure, with hawkers to fancy restaurants on offer to the gastronomic tourist. The Jakarta Post Travel presents a mini guide of four categories each with two options. Coupled with our previous article on eight classic Bandung dishes, our selection will surely help make your trip there delicious. 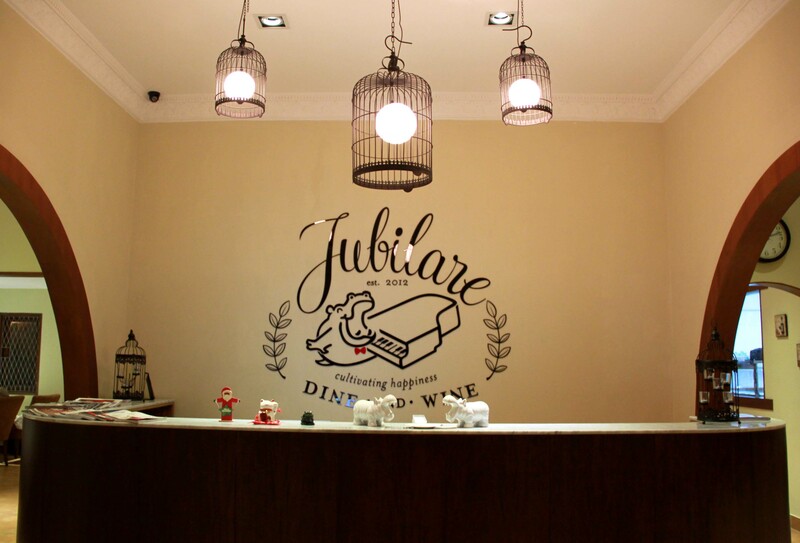 The newly-established Jubilare quickly settled itself among the scant fine-dining options in the city. Here, you can enjoy an array of mouthwatering European cuisines presented by Chef Bambang, who previous cooked up a storm at the Amanjiwo resort. The Jubilare Set Menu, pumpkin ginger soup, gigantic ravioli with salmon filling, rack of lamb and a beautiful chocolate soufflé, is a fine example of Bambang’s skills. The restaurant, which emphasizes the use of home grown vegetables in its dishes, is indeed a new force to be reckoned with in Bandung! This restaurant is housed in a beautiful colonial building that hails from the Dutch colonial era. Its beauty is further enhanced by a sizable garden fit for royal parties as well as its neighborhood, which is an area in Northern Bandung filled with old colonial retreats. 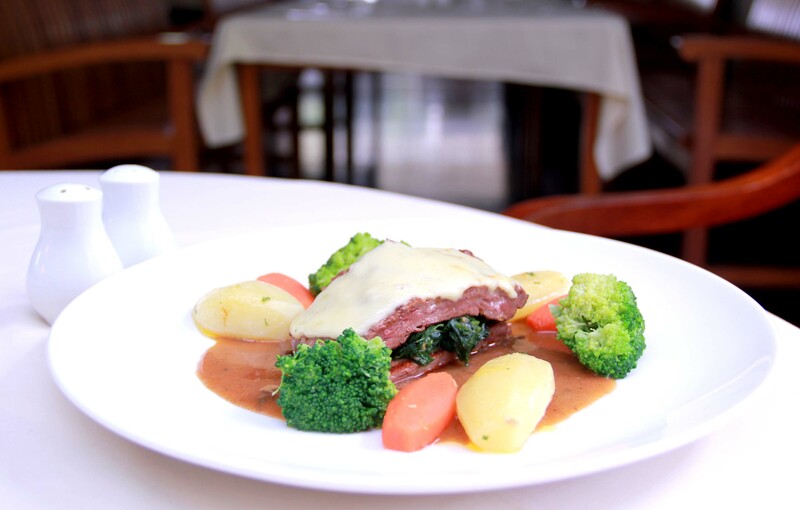 Maxi’s best dish is Filletto a la Maxi’s: A double decked beef tenderloin with spinach gratin, accompanied by broccoli, glazed carrots, buttered potato with parsley and red wine sauce. 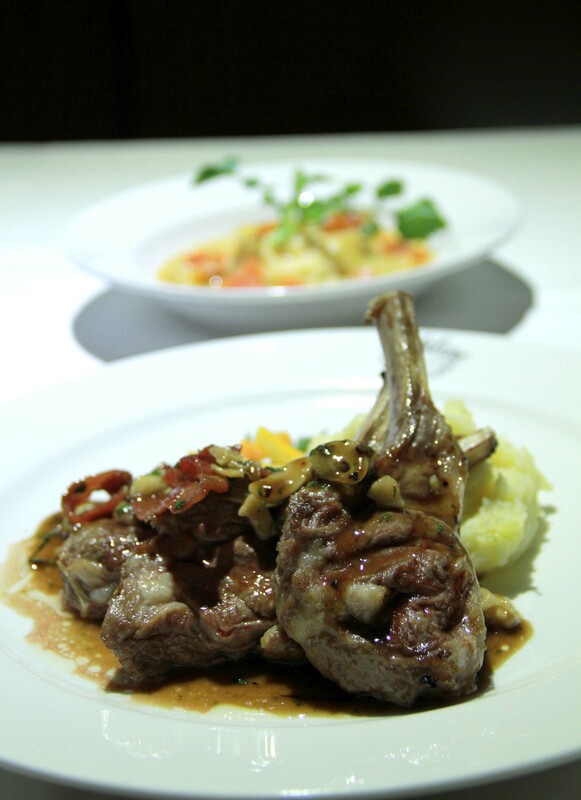 Other notable dishes not to be missed are the mushroom on beef —Emmenthaler style, poached salmon jubilee, the pronto beef parmigiana or the classic steaks that are some of the city’s best. The recipes of the late Ma’ Uneh’s amazing Sundanese cuisine have been preserved for decades by her family and flourished the family business. Ma’Uneh began modestly in the ’60s with a rather simple menu. Over time, more dishes have been developed and nowadays dishes such as karedok (mixture of vegetables with peanut sauce), fried beef lungs, steamed salted eggs, jengkol (a type of bean with meaty taste and pungent smell) stew as well as more than 30 other dishes are available. Several dishes use unique ingredients, such as ikan impun — a certain type of freshwater fish only found locally— and haremis (clams) a rarity in Sundanese cuisine. Undoubtedly one of the best restaurants in Bandung, Kampung Daun was established with the mission to astonish its visitors and it has succeeded. Designed ambitiously to resemble a traditional village encircled by trees, flowers and foliage in-between towering cliffs, Kampung Daun maintains its fresh look and remains salubrious all year round. The staff enchants diners with their swift yet polite service even though work for them can be challenging, especially with the uphill jaunts to deliver delicacies to the huts that serve as dining rooms. 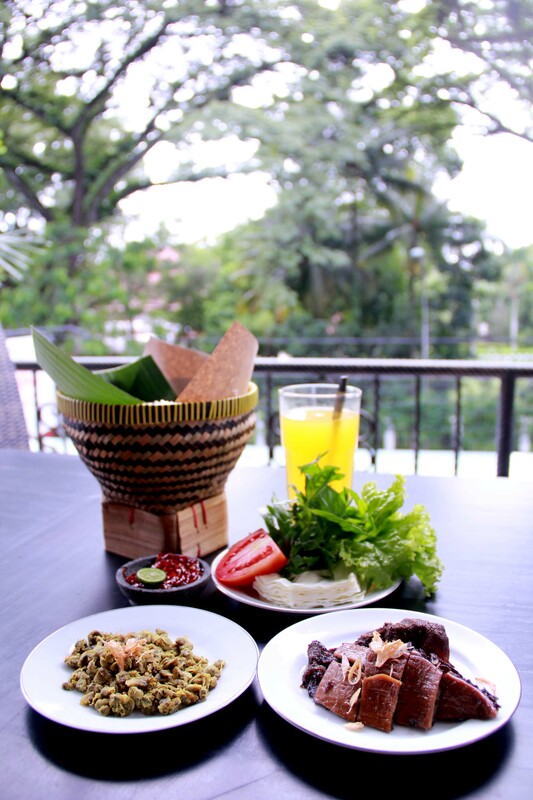 The restaurant’s food, which comprises mostly of dishes of Sundanese origin, combines with a wonderful dining ambience. 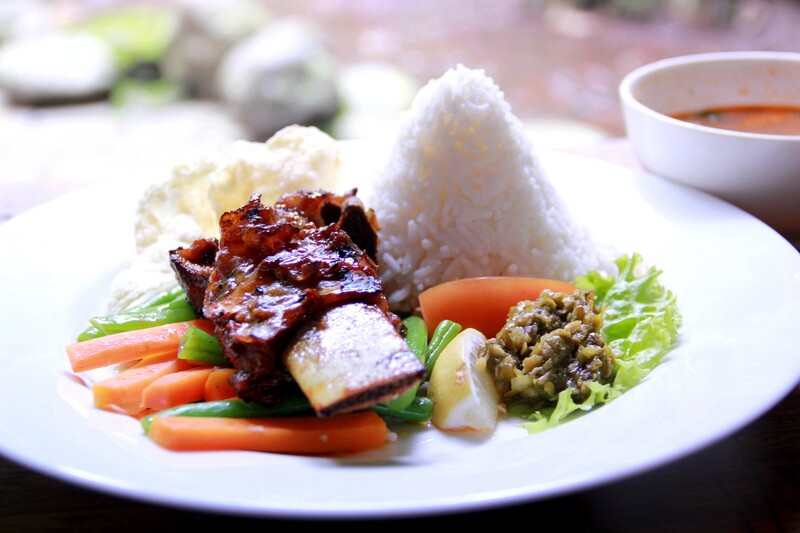 We recommend the signature oxtail soup, grilled beef ribs with soup and the grilled rice with eels and minced meat. Traditional Sundanese dishes such as banana leaf wrapped rice with fried chicken, tofu, sautéed vegetables, karedok and any gourami fish dishes are worth a try. Mang Dadeng is famous for its mie kocok, a native delicacy from West Java. Although this dish can be commonly found in hawkers all over the city, this house recipe is so popular that the name “mie kocok” is synonymous with this establishment. Usually, it is a soup-based noodle dish with beef meatballs companions, but the house mie kocok instead uses beef tendons, bone marrow and bean sprouts. 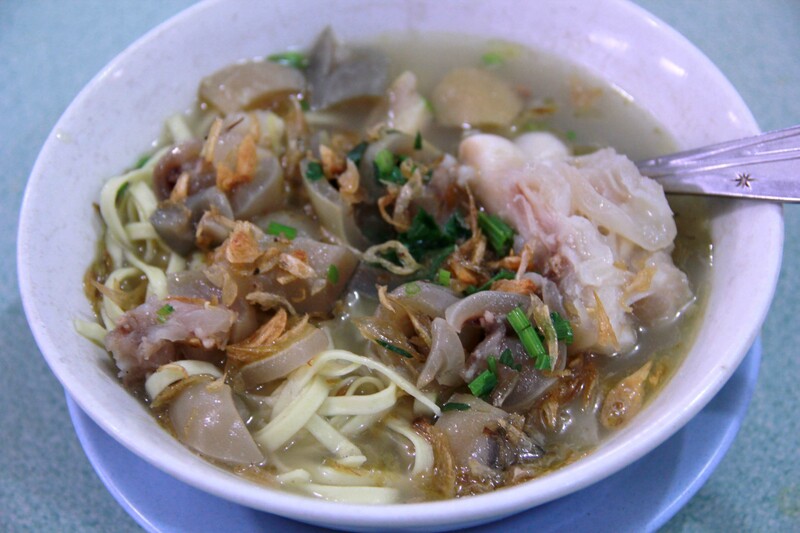 In addition, Mang Dadeng also serves sop kaki, which also uses beef tendons suitably combined with rice. Savor durian, the king of fruits — like a king — the old Kantin Sakinah way as its es durian is quite a legendary choice for dessert. 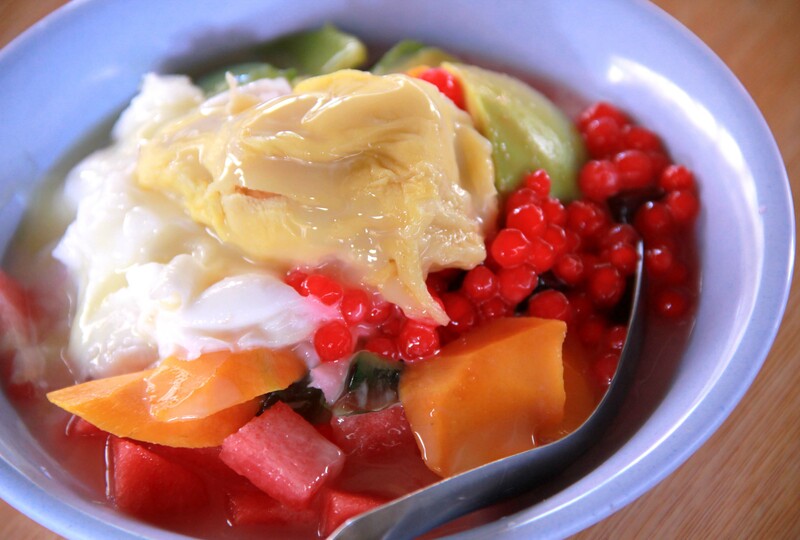 For years, this humble hawker has treated people with durian cravings by serving the fruit alongside plenty of quirky combinations such as palm sugar, coconut milk, condensed milk or chocolate sprinkles. It can also be combined with freshly sliced fruit such as watermelon, mango or avocado, not to mention, a plethora of condiments on offer. Now that is what I call an enticing dessert! Looking for a serene place fit for contemplation, enlightening discussions, good coffee and great artworks? 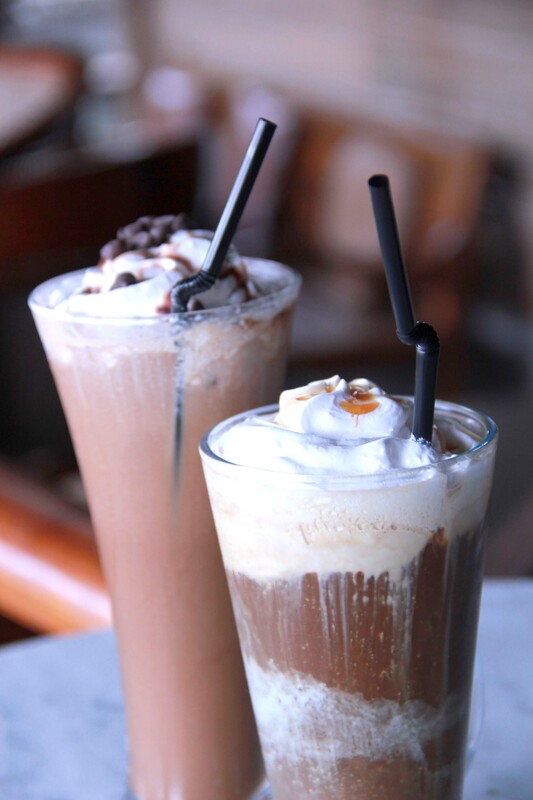 Kopi Selasar at Selasar Sunaryo Art Space has it all! Kopi Selasar is part of a particularly beautiful art space owned by artist Mr Sunaryo, located in a valley with Bandung’s majestic green hills as the backdrop. The place itself is a feast for the eyes. The baristas delight in making experimental coffee concoctions involve unusual ingredients. Try the adventurous cheese cake cappuccino or other coffee drinks mixed with a variety of ingredients such as spices, nuts, yogurt, mascarpone cheese, crème de cacao, crème de menthe, Bailey’s and many more. Be creative with your choice, after all it is an art space. Being an early pioneer of indie coffee shops, Roemah Kopi has been enjoying its legendary stature for around a decade. During your first visit you might find that the place feels more like the owner’s residence rather than a café. On further inspection its serious backyard expansion might increase its capacity but also continues the homely ambience. 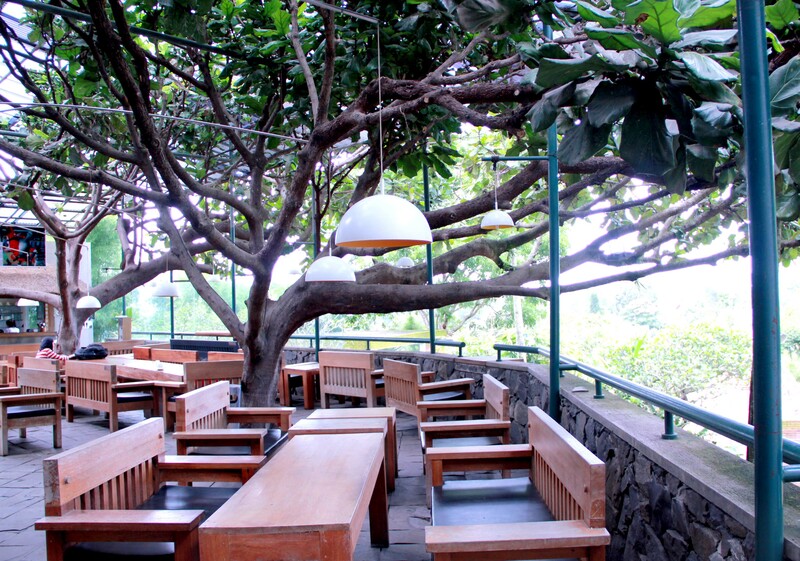 Let the gentle winds from Bandung’s rolling hills soothe you while you lay back and sip your drink with your loved ones.